Okay, so I've talked about group books vs. lap books. Let's expound on that with some thoughts on picking group books. 1)The art is going to make or break most books. 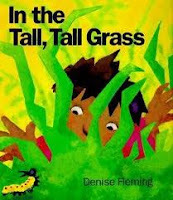 On the other hand, take a look at Denise Fleming's wonderful In The Tall Tall Grass. I have this and its companion book In the Small, Small Pond as huge oversized paperbacks, but even in standard size, the bold, colorful format reaches out to even a large group. And watch as the main character (a caterpillar) changes size in proportion to the other animals. The kids love to spot the caterpillar, and see that he is tiny compared to the birds, HUGE in comparison to the ants, etcetera. 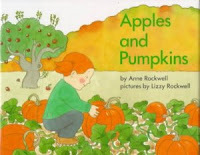 2) Find books that have something to get the children involved in the story. Working with a group is performance. As the stripper said in "Gypsy"--"You gotta get a gimmick!" Take a look at that book. What does it have that you can use to do more than just a reading? 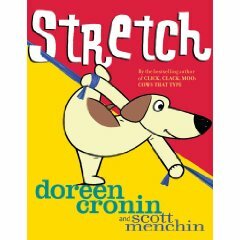 And you can get up and do the movements in books like Eric Carle's wonderful From Head to Toe and Doreen Cronin's recent gems Stretch and Wiggle. This is especially important if you're reading to toddlers and preschoolers, but even the K-2 age will respond to the chance to get up and participate, and you'll all have fun doing so. 3)Poetry is great, verse is great, but it has to READ ALOUD WELL. 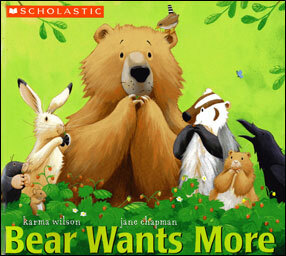 I have panned more than one picture book on Good Reads because its scansion flops and it does not read smoothly out loud. Try reading something to yourself out loud before trying it on kids. If the rhythms are awkward, it will not be a pleasure to your ears or to theirs. Read something by Margaret Wise Brown or Maurice Sendak and you will know what a well written children's book in verse can be. 4)You are not reading to other children's librarians, or teachers, or to adults at all, though there may be adults in your audience. You are reading to kids and they haven't heard of School Library Journal, or the Caldecott Medal or even the NY Times bestseller list, for heaven's sake! They're not going to be impressed by any of that--and you shouldn't be either, truth to tell. Kids know what they like. 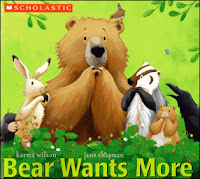 If they don't like it, they will wiggle and squirm and you will feel like doing a story time is an effort. But catch them with the right book, and they will sit up and PARTICIPATE! When they stop you to ask a question, when they make a comment, when they are silent not because it is "quiet time" but because they are so engrossed in the story, when afterwards they want to talk about the story not because they were prompted but because they are interested--it's magic! They will willingly follow you wherever you go. You will get a fabulous experience from the sharing. Probably not the experience you will expect--kids don't follow the script, but one you will treasure all the more for the fact that it's a shared experience. 5)Love the books you are reading! Don't pick them because I recommended them, or because they're on somebody else's list, or because they're the flavor of the month right now. Pick them because they speak to you, and have something you want to share. You'll have fun. I do. And so do the kids!